In 12 years we have made inroads towards the evolution of the seahorse as a captive and successfully bred species. We thank all who help, contribute and support the our ongoing efforts. 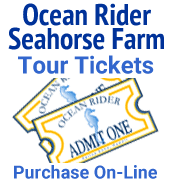 Ocean Rider will continue to maintain a focus on ecologically minded and safe practices towards the sea and the seahorses and encourage all to maintain a similar spirit. We look forward to advances in ocean conservation and seahorse management . We are excited about the road ahead. Thanks to all for their support.